German design student Philip Frenzel has designed an iPhone case that springs open to stop your device from smashing when you drop it. 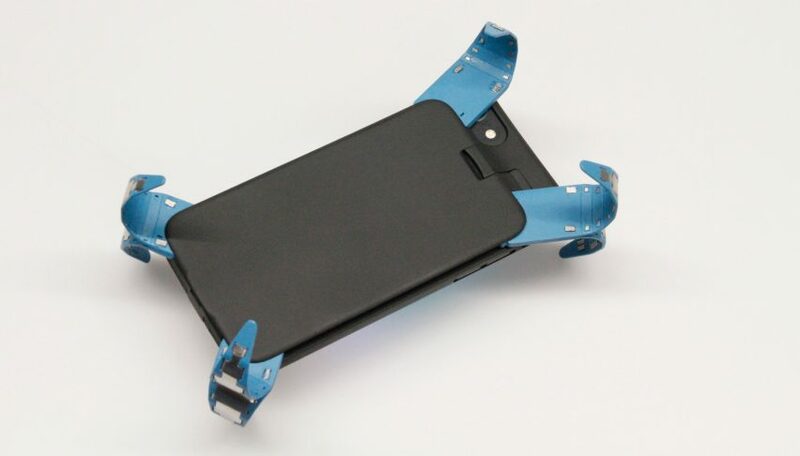 The ADcase — the AD stands for active dampening — hides four spring-loaded legs that only pop out once the phone case is in free fall. They curve outward in either direction from the four corners of the device, creating a 30-millimetre buffer between the phone and the ground. Frenzel, a mechatronics masters student at Aalen University in Germany, has said he wanted to make the equivalent of an airbag for the mobile phone. His case is only a prototype a this stage, but he plans to crowdfund its further development through an upcoming Kickstarter campaign run by his new company, Frenzel + Mayer Solutions. “Our vision with ADcase is a smartphone case that combines maximum protection with elegant design,” said Frenzel + Mayer Solutions. While the case briefly takes on an alien, octopedal appearance when in active protection mode, it is designed to be slim and unobtrusive during regular phone use. It adds 0.6 millimetres to the rim of the phone and 4.6 millimetres in a card-sized protrusion on the back. The case has been made to fit iPhone models 6 or later. As well as heavy-duty protection, the ADcase website says the product will also provide extra battery life and wireless charging ability. Frequent phone-droppers can rest assured that, unlike car airbags, the ADcase is designed to be reused. In an interview for the German publication Preview Online, Frenzel said that he had experimented with actual airbags and foam in earlier iterations of the design, without success. The final form was inspired by his mechatronics studies. He built the sensor in the case, which detects when the object is in free fall. The German Mechatronics Society awarded Frenzel a student prize for the work. Another brand reimagining phone accessories is Nolii, by British designer Benjamin Hubert and entrepreneur Asad Hamir. Their case has a clip section for attaching add-ons that suit the user, like a battery pack or card holder.